1. Donaghmore. Composite Cross. East Face. Detail of Shaft. Panel E2. Adoration of the Magi. 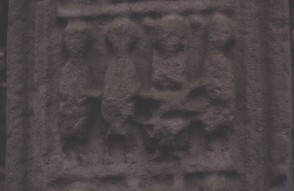 This is a close up of one panel of the east face of the composite cross at Donaghmore Co. Tyrone. This panel E2 depicts a New Testament scene. Matthew 2: the Adoration of the Magi. The Adoration of the Magi. New Testament. Matt. 2. The virgin Mary is seated, facing the front, with the child Jesus across her lap. The Magi approach from both sides, their gifts are no longer visible.